Treat your brain to the pulsating pleasures of musical platformer Circa Infinity on September 9 this year. 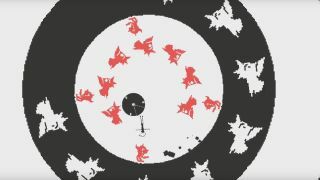 It's a game about racing inwards through a spinning series of circular zones while music pounds and enemies dance around you. As you can see from the latest trailer, it is quite frazzling to the senses. Experience it first-hand in the playable demo. The finished game will feature 50 levels with a handful of boss fights and a speedrun mode that's sure to generate some dazzling YouTube runs. Find out more on the Circa Infinity site and the Steam page.